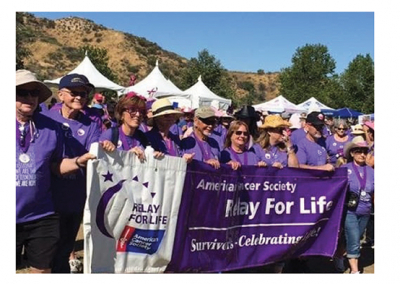 The American Cancer Society Santa Clarita Unit is holding its 21st Annual Relay For Life on May 18 and 19 at Central Park located at 27150 Bouquet Canyon Road, Santa Clarita. Relay has a new format this year. The team walking fundraiser will be an 18 rather than 24-hour event starting with the Opening Ceremony at 3 p.m. on Saturday. The Survivor Ceremony will follow at 6 p.m. honoring cancer survivors and caretakers. The Luminaria Ceremony, remembering those who lost their battle to cancer and those continuing the fight, will take place at 9 p.m. To purchase luminaria bags or to personally decorate one, please contact Luminaria@SCVRelay.org. The closing ceremony at 8:30 a.m. on Sunday, May 19, will recognize all volunteers and participants, celebrate their accomplishments, and inspire the community to continue its tireless efforts to end cancer. The theme for this year’s Relay is “Game Over, Cancer!” The Central Park track will be transformed into a jumbo Monopoly board, and Relay teams are encouraged to decorate their booths as popular board games or video games. Fun night-time activities are planned, including a performance by the band Operation 90s which will create an instant 90s nostalgia party. Entertainer John Joseph, who performed at the 2017 Relay, will be back this year to sing and dance for the cause. Food trucks will also serve hungry participants from 5 p.m. to 10 p.m.
All survivors and their caregivers are invited to a free Pre-Relay Survivor and Caregiver Dinner event on May 4 from 6 p.m. to 8 p.m. at St. Clare Catholic Church in Canyon Country. Festivities will include food, fun, and raffles. Guests are encouraged to come with their “A Game” to play a special version of the game show “Survivor.” Please RSVP by April 27 to emily@scvrelay.org. The goal this year is to raise $300,000 to support the education, research and services that the American Cancer Society offers. It’s not too late to become a sponsor, make a donation, or join a team! For more information and a calendar of events and fundraisers, visit www.Facebook.com/SCVRelay or www.SCVRelay.org. You can also call the SCV ACS office at 661-298-0886, option 3 for more information.